I remember the first time I swam in the ocean like it was yesterday. That one single act changed the trajectory of my life. This was when I fell in love with Hawaii Blue. For me, the crystal blue water is paradise; it is therapy for me. When I had a bad day, I craved time in the water to decompress. It was 1985. I was visiting Hawaii with my maternal grandmother, an amazing, loving woman. ; one of the best trips of my life. Hanauma Bay is a protected reef on the island of Oahu. It is the iconic beach from the Elvis movie, Blue Hawaii. The drive to Hanauma Bay is one of the most beautiful with sweeping vistas of ocean waves crashing along the jagged, black rock of Oahu’s coast. Taking you past tide pools in Waimanalo, the Magnum PI house, and Sea Life Park with Dolphinquest, the Makapuu lighthouse and Sandy Beach. As I waded into the cool, blue waters of the Pacific, I was filled with trepidation. Random thoughts about sharks, jellyfish, and barracuda filled my mind as I slowly walked deeper into the water. I was astounded by the amount of life in the water, by the majesty and beauty of a coral reef. I had a handful of fish food with me and I envisioned a tiny fish gingerly taking food from my hand. However, I accidentally dropped some and the fish began swirling around me. I was terrified! The number of fish was staggering. Rainbow colored parrot fish, yellow tang, moorish idols and the humuhumunukunukuapua’a (Hawaii’s state fish), green sea turtles and 400+ species of fish call Hanauma Bay home. Once I realized that they weren’t attacking, I began to relax and enjoyed watching them dart about. I loved the buoyancy of the Pacific. I loved the sea life. I loved the beautifully colored coral below. Below the surface, it was quiet. I found a kinship with the underwater creatures. I have been a swimmer all my life and have very good breath control which allows me to submerge myself and become one with the underwater world; no equipment between the sea and me. I didn’t know it then, but I had found my place in this world – in the open water. It is where I am truly happy as joy fills my heart when I swim in the open water. I feel free. It is a connection that cannot be expressed in words. Ever wondered why we are drawn to water? It is ingrained in our DNA. When we hear the rhythmic sound of waves crashing, we are soothed. When we have our toes in the sand and we look out at the water, there is a peace, there is a connection. Water is life and to my kindred marathon open water swimmers, it is heaven, it is home. I went to Hanauma Bay a second time in 1991. My mom was competing in the Kona Ironman Triathlon and we stopped over briefly on Oahu. I immediately noticed a decline in the amount of fish in the water; enough to shock me. No swarms of colorful fish. It tugged at my heart as I left Hanauma Bay pretty bummed. I didn’t know that our planet’s reefs are such a delicate ecosystem. I had no clue that the sunscreen I wore in the water was contributing to the demise of our reefs. In 1994 I quit my job and moved to Kona spending 1 year on the Big Island and 15 years in Kailua and Kaneohe on Oahu. There is magic in Hawaii. It is truly paradise and calls to me. That may sound crazy but it’s true. I miss it like a dear friend I haven’t seen in years. Once Hawaii touches your heart, it doesn’t let go. I have done open water swims in some of the most beautiful water in the world, Turks & Caicos, Bermuda, and Dubai to name a few. Turks & Caicos has the 3rd largest barrier reef. On the beach outside our hotel, was a buoy enclosure where we weren’t allowed to swim. A piece of reef was being destroyed by the very people so enthralled with the islands. Day after day, we heard the whistle of the lifeguard telling tourists to stay out of the enclosure. I swam around the perimeter of the reef diving down and seeing what was underneath; I saw a 5 foot long barracuda that sent me dashing for the shore. In Bermuda, every single beach had sections of bleached coral, white with grey slime coating. Patches were alive with fish swimming about, however, there was more dead coral than live Once again, I left with a tugging on my heart. Coral thrives at temperature between 73 and 84 degrees Fahrenheit. In 1998 the first global reef-bleaching event took place. An underwater heat wave killed 16% of the world’s coral. In 2010, the second bleaching event took place. Most recently, in October of 2015 the third global bleaching event took place. The warming of the earth’s oceans are killing the reefs. If this trend continues, the effects will be catastrophic. I grew up oblivious to the plight of our oceans. Small steps can make a big impact. Use sunscreen that doesn’t contain oxybenzone to help save our oceans. Up to 14,000 tons is brought into the oceans by sunscreen wearing swimmers and triathletes. Oxybenzone is toxic to coral causing endocrine disruption, DNA damage, and exacerbating coral bleaching. In 2016, Ironman recognized the dangers of so many triathletes using sunscreen containing oxybenzone and began a campaign to eradicate this toxic ingredient in its races. Kudos to Ironman! If we are mindful, kind to one another, and love instead of hate, we can make this world a better place. I challenge you to do this… Be conscious of the life around you. When we move through life being mindful, the impact is be felt globally. Mahalo nui loa. Dana MacCorquodale is the Head Masters & Open Water Swim Coach at TIDE Swimming in Virginia Beach. 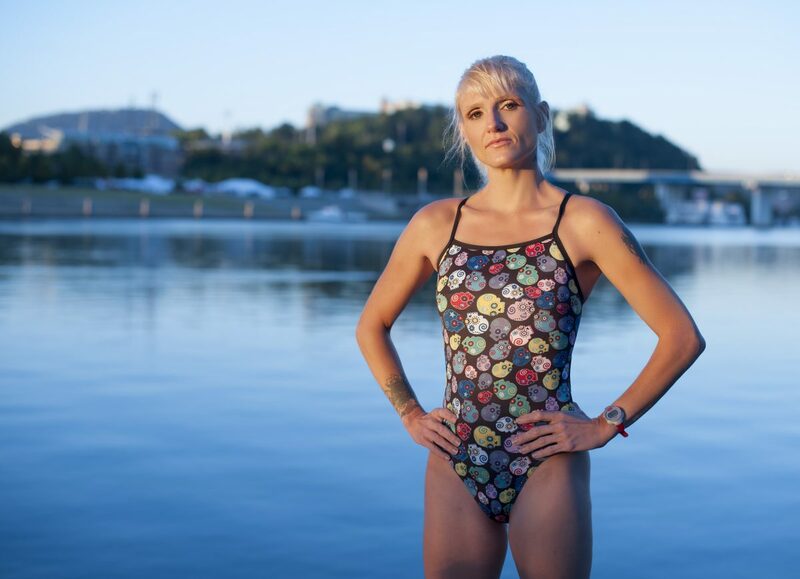 She is also a top 10% Ironman Finisher, marathon open water swimmer & ultra runner.